This year’s Centennial celebration includes the return of the downtown Pleasanton Parade, a brand new concert format, and a variety of distinctive memorabilia chronicling its 100 year history. The first Alameda County Fair ran from October 23 to October 27, 1912. Local leaders sought to form a modern fair, and in 1939 the Alameda County Fair Association was born. Once considered a racing fair, the Alameda County Fair now boasts livestock and agriculture, thrilling carnival rides, beautiful quilt exhibits, baking contests, fast-paced horse racing, or simply a corn dog. Come join the celebration as the Alameda County Fair celebrates its 100th milestone. We’ve been to a lot of Country Fairs over the years – all the Bay Area ones and some as far away as the famed Erie County Fair in Buffalo, New York. 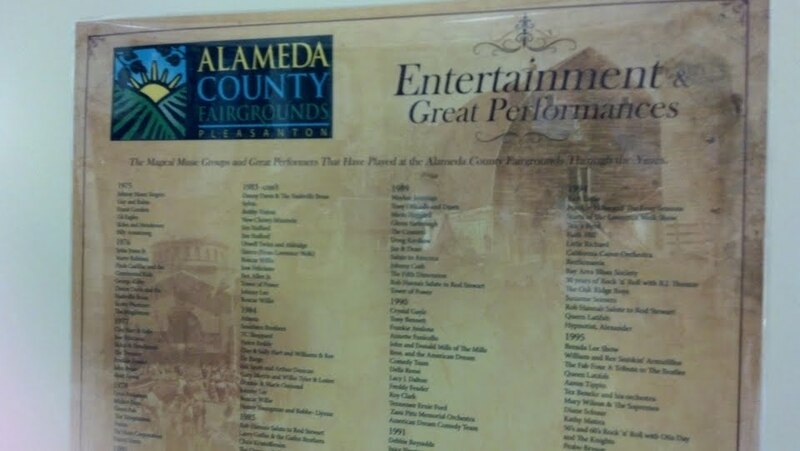 Of all of them we like our own Alameda County Fair right here in Pleasanton, CA. Why? Because it looks and feels like a county fair, not some urban fair trying to masquerade as a real county fair like San Francisco’s or Marin’s. This one has it all including a full stable of farm animals, a large 4H exhibit hall, FREE name concerts nightly (included with admission), every kind of fair food you could imagine, a full midway of carnival rides and games, three exhibit halls of interesting gadgets , nicknacks, gemstones, etc, a major garden display, every kind of fair food you could ask for such as funnel cakes, BBQ, corn dogs, pepper steaks, cotton candy, pink popcorn and on and on. One of our favorite attractions is the Wine Garden where Terry Hanks and his blues band has played the last several years. Worth the price of admission alone. 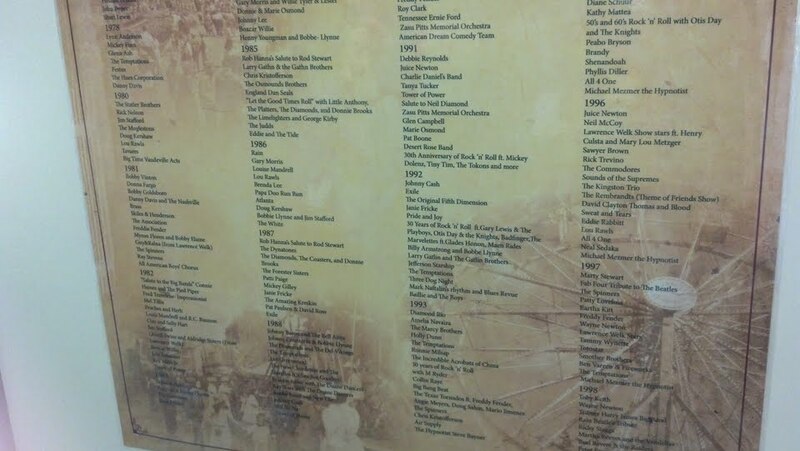 FREE CONCERTS FEATURED MOST OF THE GREATS! Over the years we’ve seen music talent like the Platters, ‘The Diamonds, Donnie Brooks and his cavalcades of stars including Tiny Tim, Badfinger, Pat Upton, Cannibal and the Headhunters , Al Wilson and many more (it was a sad day when Brooks stopped coming around), Pat Boone, Neil Sedaka, Freddy Fender, Annette and Frankie. Johnny Cash, Bo Diddley, Marty Robbins , Tower of Power and on and on. The music today may have changed , sadly, but the fair remains much as the same as it has many of those 100 years. The grounds, in themselves, are a pleasure to behold- the bucolic stretches of shade trees and grasses set as a backdrop to the many food stands and exhibits, carnival rides and animals. soon become a big fan of MC DONNIE (‘Mission Bell’) BROOKS, who MC’d the show and told some fun one liners. He would come back many years afterthis with a changing cavalcate of stars we always looked forward to. ago not long after a serious car accident. 1986 GARY MORRIS, BRENDA LEE, PAPA DOO RUN RUN – I remember these as standout performances. a little variety this year, also PAT PAULSON plus PATTY PAGE. at a time when unauthorized gbroups were using original group names.Also The New Chordettes. I’m just one of many frustrated A’s fans who still views the team, butfrom afar. It’s because of an overship that runs the team for it’s ownstrange interests, rather than to win games. And they’ve been doing thatmuch too long. Bascially, with baseball’s crazy revenue-sharing rules, the A’s are making money and just sitting pat until the ‘little babies’ get their new shiny ball park. their weaker, inexperienced ord new pitchers (Blevins, NOrteno and Fuentes) who also haven’t played with the team much. the Giants, but with inexplicable moves like above, the lead quickly changed – and the A’s blew a big opportunity to noto only go to .500for the first time in a long time BUT TO CAPTURE THE RESPECT, ANDINTEREST OF SOME FO THE LARGE SAN FRANCISCO GIANTS FAN BASE. into further. If they A’s won even two games of the weekend seriesthere would be a Bay momentum shift and they could pick of at leasta few hundred true baseball fans who would come across the bay,if not disowning the Giants but to see another good baseball team. But, the way the A’s gave the games blew any possible momentum.Imagine the story, team with one-third the payroll Makes Mincemeat out of Giants. But, whenever the A’s approach .500 ball this same theme seems to happen. Ownership couldn’t standit if the A’s actually contended. Beane has fun moving players like monopoly. With all the movement, sure , he makes good tradesbut he also gives away top prospects time and again , just whenthey are winning over fans. Go figure. to still pulling strings such as in this weekend series. know each other and have played together for some time? fans WILL COME to the A’s ‘crappy ballpark.’ Even if a lot of themare Giants fans, people will still come. The Haas family had already proven that with major marketing and now the A’s are benefittingwith doing little marketing. Hit these ‘new’ fans up with somereal deals for tickets for rest of season, etc. but, better, don’t preventthe team from playing good to great ball as they were until thethe late innings in Giants games. .
the baseball world with the token gesture of getting Cespedes. Let’s see how long he’s with the team. Call him Trader Billy. And the saddest thing is that the A’s HAVE the money. for five or more years since coming to Oakland. Moneyball Shmunyball! years by Selig, who comes out the better man this time in my opinion for not giving into their demands at the expense of repeatedlyliquidating the team. Before I praise Selip too much, perhaps heshould be questioned for letting Beane get away with hurting the team year after year. Perhaps thats the or a reason he hasn’t moved faster on the ballpark issue. on the A’s ownership to finally get off the pot. more action like this, from business AND fans. showing he can bring in all these new players to do well. CONFIENCE OF HIS REGULAR STARTING PITCHERS and so forth. Beane is a big paradox and I feel sorry for Melvin. keep their jobs if they’re hired by the A’s, but not sure. from happening. And , yes, I’m looking at the front office. seeing the hated, obnoxious Giants sweep by the A’s when the A’s shouldhave won at least two of the games… Of course, this is probablywhat Wolf, Beane and Co want to they have more reason (ie fewer fans)to move the team. On the other hand, if more fans, announcers, etc finally really speak out I’ll be right there with them , as I havebeen doing, like this open letter.